As promised: cookies. The inclusion of molasses and whole wheat pastry flour make these very slightly more healthy than the average cookie, but don't let that put you off thinking, "Eww, healthy=boring." These cookies are amazing. The fresh orange juice and zest and all the spices really make them sing with flavor. Warning: they are highly addictive. It would be worth your time to make a double batch if you have more than two people in your household. Or if the two people in your household are like me and my girlfriend. I made a batch tonight and they're seriously going to be gone in less than 36 hours. 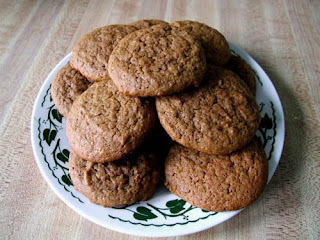 My recipe is a modified version of Joy of Cooking's Gingersnap recipe. I added the whole wheat pastry flour and jacked up the spices and orange flavoring. You can use pure all-purpose flour if you want, but definitely only use fresh juice and zest. It really makes a huge difference. In a medium sized bowl, cream together butter and sugar until fluffy. Add egg, molasses, and orange juice and zest and mix until well combined. Slowly add flour mixture. The dough should be the consistency of thick buttercream frosting. Form dough into balls about 1 inches across and bake on a greased, lined, or nonstick cookie sheet for 10 to 12 minutes.